Happy Saturday!! I cannot believe that it's already Saturday. 0_O I want to share with you a recipe that I came up with yesterday for lunch. I didn't have much time to spare before I headed to volunteer with the kids, so I knew I had to concoct a quick and simple recipe within at LEAST 30 minutes! 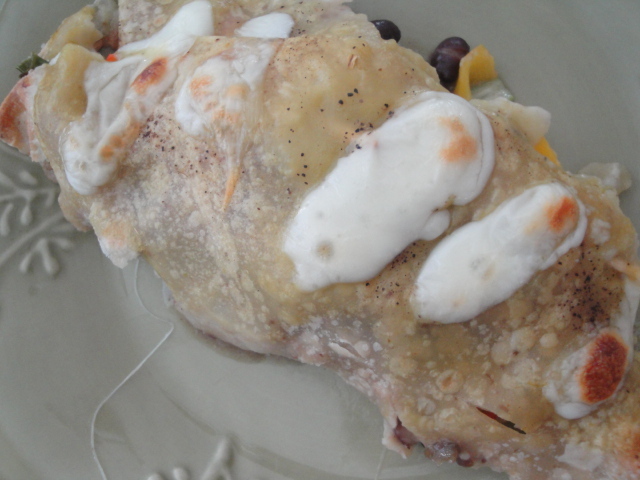 Fortunately, this enchilada took me about 15 minutes flat! That is--without the baking, which wasn't a problem at all since I was just finishing up getting ready upstairs. In the meanwhile, this dish was a-cookin'. First, preheat the oven to 375 degrees and lay the two tortillas down on a flat surface. In a small bowl, combine the beans, garlic powder, and the nutritional yeast. Spread that mixture evenly on top of the tortillas and then spread all the chopped veggies on top. I also added the cubed chicken sausage on the veggies but this is completely optional if you want to make this vegetarian. Next, add the cheese and about a few drizzles of the green salsa all throughout. Now, take the soaked toothpicks and after laying down the enchiladas on the pan, just fold the two ends and secure it with the toothpicks. Make sure they're wet so they don't burn up! Drizzle the rest of the salsa on top and sprinkle it with black pepper. Bake it for approximately 10-12 minutes. Keep an eye on it though because I used my toaster oven and it may differ in a regular oven. After that's baked, take it out and sprinkle it with some cheese on top and bake it for about 5 more minutes. 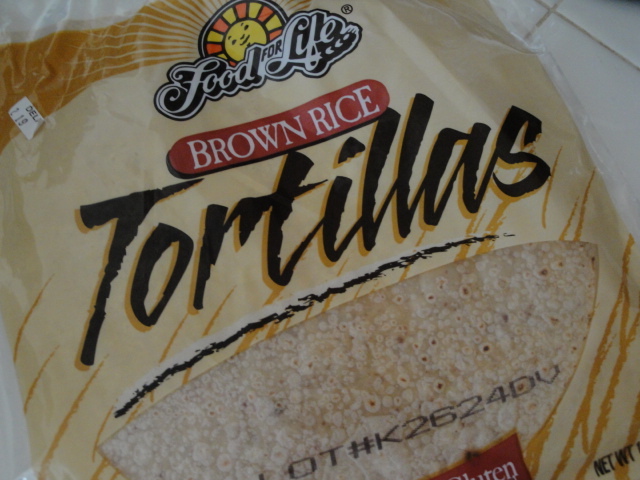 This tortilla is really good! And kind of chewy. Remember instead of this you can add more beans. I would spray the pan! I ordered the Scorpion Burger.. In case you didn't know, I have a bad case of mustard-love. As I ate it, I kept drizzling more mustard on top. That's how sick I am in that department! Baaahaha. 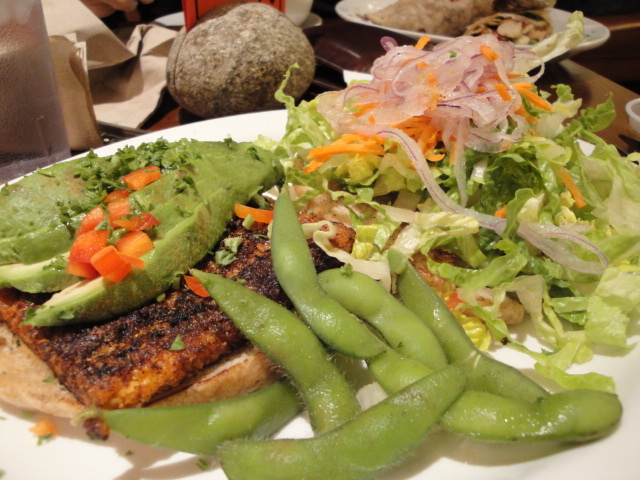 This is grilled seitan with a bunch of veggies on top, and chipotle dressing. Greg ordered a really good wrap and I cannot remember the name for the life of me. I don't know if you're ready for this picture...but here goes nothing! 0_O Bam! It's called the Rose Cardamom Cupcake. It's so pretty and utterly vegan!! But it was WAY too flowery for my taste. I'm not a picky eater, and that's why I still enjoyed it and finished it with Greg. But I do think it would have been even better without too much Flower extract...? Or whatever gives it the strong flavor. Today I'm off to Valencia near SIX FLAGS!! I'm going with some friends to Elaine's mid-residency concert. This sweet girl is so gifted in her flute skills and this is her OWN concert. How exciting!